As part of the “Digibus® Austria” pilot project there will be test drives on non-public and public test tracks. The test tracks are used for real-world testing and also serve to demonstrate the project’s results. The Salzburg Ring in Koppl near Salzburg is used as a non-public test track. 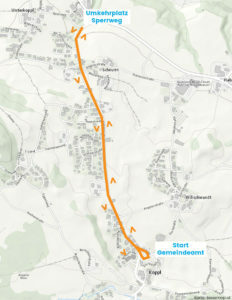 The municipality Koppl is a typical example of the so-called last mile scenario: the village center is located about 1.4 km from the B 158 away and thus from the bus line 150 (Salzburg – Bad Ischl) of the Salzburg Transport Association. This distance – the “last mile” – is often a major hurdle to actually use public transport. The shuttle bus line 152 between the federal highway B 158 and the center of Koppl runs due to economic reasons only very rarely. An autonomous minibus could close the gap for the less profitable times. The test track is ideal for testing autonomous vehicles in a “first / last mile” scenario in a rural setting in a mixed traffic situation.